Voltaren Emulgel,Voltaren Emulgel for Muscle and back Pain! 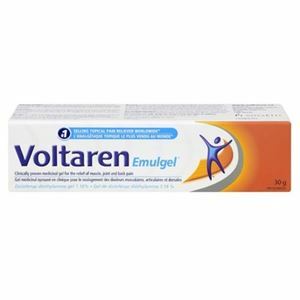 Voltaren Emulgel for Muscle and back Pain! With age, our joints and ligaments get weak due to wear and tear resulting in painful and inflamed joints. Voltaren Umulgel is a pain relieving ointment that calms the muscles and reduces inflammation thus increasing the healing process. This is a non greasy gel that penetrates into the skin and has a mild fragrance. Non Medicinal ingredients include Carbomer, cocoyl caprylocaprate, diethylamine, isopropyl alcohol, liquid paraffin, macrogol cetostearyl ether, perfume, propylene glycol, purified water. For adults and adolescents aged 16 years and above, recommended dosage is applying the gel 3 to 4 times in a day.